EcoLogic served as the principal water quality advisor to Onondaga County Department of Water Environment Protection (OCDWEP) from 1997 to 2012, a period that encompassed a prolonged effort to identify cost-effective and environmentally sound approaches to comply with the Amended Consent Judgment issued by the NYS Department of Environmental Conservation and the US Environmental Protection Agency. Onondaga Lake had been impaired by years of municipal and industrial discharges to this small urban lake. EcoLogic worked with OCDWEP to design and implement a complex ambient monitoring program of the lake and its watershed to meet specific objectives related to the lake’s restoration. 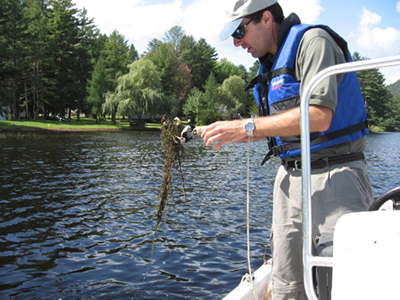 Water quality conditions were monitored, along with multiple levels of the lake food web: phytoplankton, zooplankton, fish, macrophytes and macroinvertebrates. In addition, EcoLogic supported efforts to negotiate a discharge permit, collaborated with Anchor QEA on a white paper, reviewed water quality models, and provided technical review and input to a phosphorus Total Maximum Daily Load (TMDL). We also compiled documentation required for a regulatory delisting of the lake as impaired for ammonia. Our many years of effort culminated in an accepted TMDL in June 2012. Dr. Liz Moran continues to serve on the Onondaga Lake Technical Advisory Committee as the TMDL is implemented. Visit the Onondaga County website to learn more about the Onondaga Lake Ambient Monitoring Program. In 2016, Onondaga County re-engaged EcoLogic to provide enhanced public outreach and communication regarding the remarkable recovery of this once-degraded resource. 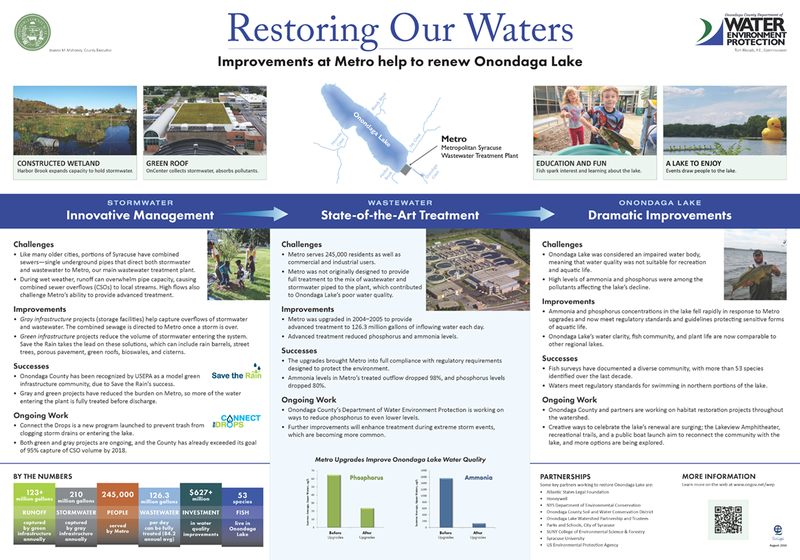 As part of this effort, we designed a poster for the County’s annual Clean Water Fair explaining how upgrades at the Metropolitan Syracuse Wastewater Treatment Plant led to dramatic improvements in Onondaga Lake.